... We spent the week end at friends' house in Maine. Everywhere I go, I bring a book, and a tote with some crafting supplies. perfectly flat at the bottom, and heavy. ... So I decided to make a crocheted pebble for our hostess. 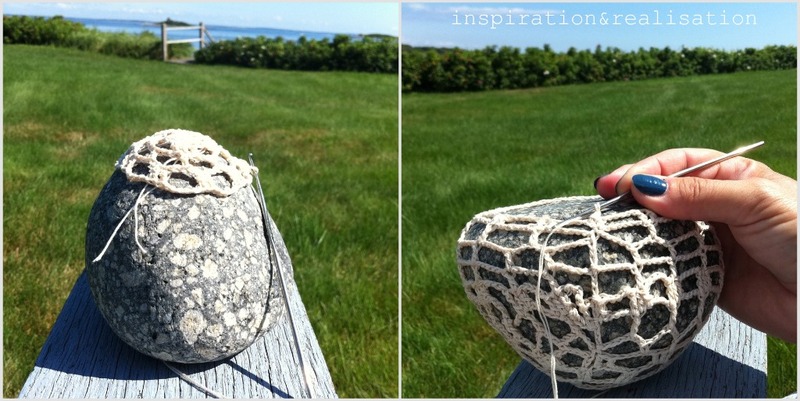 Is there anything better one can do, than crochet while looking at the ocean in a perfect sunny day? Well how fabulous is that? I love Maine..all of New England is so beautiful. Glad to hear you had a lovely time with a friend. I love how this one turned out!! Great job, Donatella! :) I really need to give this a try! So cute! Terrific job! I really want to do this- I just need to get smaller hooks! this rocks! :) seriously, it does, i'm not just saying that because it's a rock hahaha! What a great way to dress up the doorstop! I love it, thanks for sharing!! 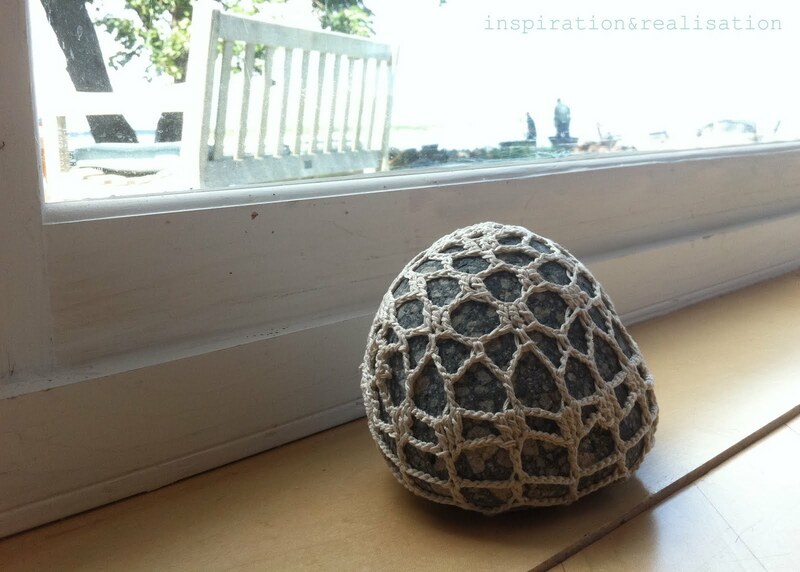 I've been wanting to try a covered rock like this, and yours came out beautifully! 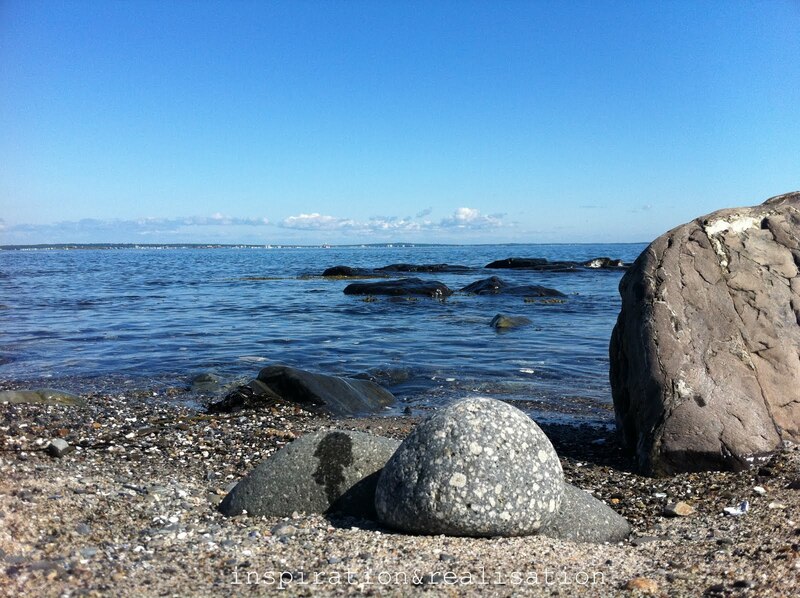 I haven't made it to the ocean yeat this summer, so I'm envious of your crocheting view there. :) Thank you for sharing. I love how this can protect a door from damage, too. It also reminds me of a yarn bomb. Fun! That's so pretty! Didn't know this could be done. Can it be knit, too, or just crocheted? I'm sooooo loving this. Will be featured for sure..., and am composing a post on your fab coral bathroom (obsession haha) too. Very creative and functional, too. What size hook and yarn fiber/weight did you use? ?